Nnamdi Kanu To Buhari: Defeat Me With Superiority Of Your Argument Not With AK 47. Nnamdi Kanu, leader of the Indigenous People of Biafra (IPOB), has asked President Muhammadu Buhari to come up with a better argument in the “debate for freedom”. Kanu said this on Wednesday in Abia state while reacting to Buhari’s marching order to security agencies to tackle the excesses of secessionist groups, including IPOB. The president had also discussed the issue of IPOB – among other “security threats” – with service chiefs during a meeting on Tuesday. But Kanu faulted claims that IPOB is a violent group. While stating that the “recourse to brute force to solve national problems would never work,” the IPOB leader said the people must not be “railroaded into succumbing to intimidation”. “In this debate for freedom, everybody has to be heard. Buhari should defeat me with the superiority of his argument not AK 47,” he said. “Some people quickly recourse to violence, hate and intimidation because they have lost the force of argument. 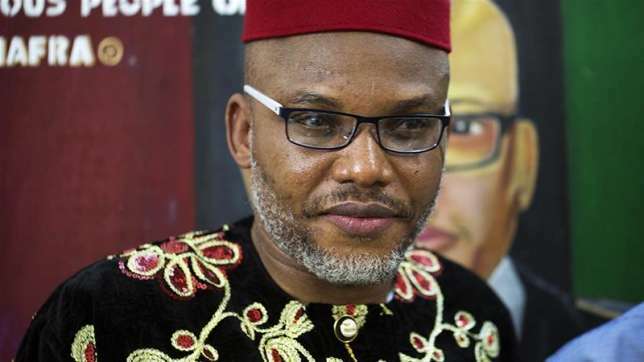 Kanu added that the group would never resort to violence in its quest for a sovereign state of Biafra. “There is no need for people to be afraid of the internal operations of the IPOB. We will never ever resort to armed violence or armed conflict of any sort,” he said.